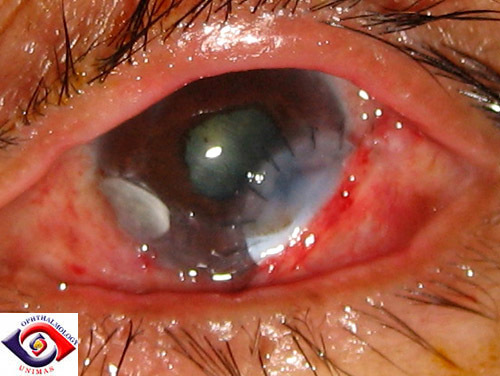 A 53-year-old presented with a left red eye and normal vision in mid-December,2005. Examination revealed peripheral marginal keratitis and corneal thinning. Apart from non-insulin dependent diabetes mellitus, he had no history of note. A series of blood test including auto-immune screening was negative. He responded to topical steroid and antibiotic. A course of oral doxycycline was also given for its anti-collagenase activity to prevent perforation. During the course of treatment he developed asymptomatic calcification plaques at the sites of the corneal thinning but otherwise the eye was quiet. He returned in mid-March, 2006 with a sudden but painless drop in vision from 6/6 to CF. Examination revealed breakdown of the calcification plaque with iris prolapsed and a shallow anterior chamber (Figure 1). peripheral corneal thinning with calcifications. An emergency operation was performed on the same day, the iris was excised to reveal a corneal perforation measuring 2.5mm in diameter. As corneal graft required several days of ordering from oversea, we patched the eye with amniotic membrane (which we kept in store as air-dried sheet from the Tissue Bank of the Universiti Sains Malaysia). The air-dried sheet was soaked in normal saline for five minutes for rehydration and cut to fit. Multiple layers of amniotic membrane were first placed over the perforation and a piece of amniotic membrane that folded over itself was sutured to the cornea and beneath the surrounding conjunctiva (after performing peritomy around the site of the perforation). chamber remained flat though not leakage is observed around the edge of the patch. Post-operatively, the vision remained poor at 6/60 with a flat anterior chamber. No leakage was seen but the anterior chamber remained shallow after 4 days. A bandage contact lens was applied at this stage but without effect on the depth of the anterior chamber. A repeated amniotic membrane graft was performed one week after the initial repair. This time the rim of calcification was removed and two double-layered of amniotic membrane were sutured to the cornea and under the surrounding conjunctiva after patching the perforation with new layers of amniotic membrane. To avoid perforation of the adjacent nasal calcification plaque, a double-layered of amniotic membrane was also sutured over it. 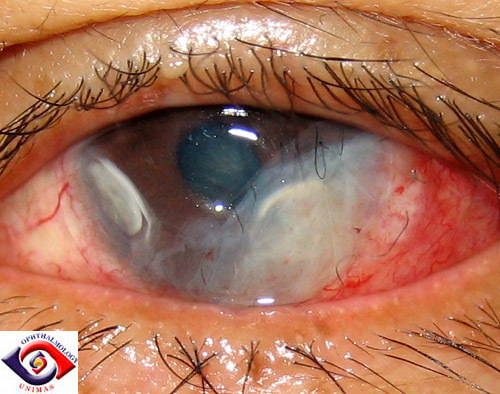 Despite the second operation, the anterior chamber remained flat after four days even with a contact lens. A tectonic corneal graft appeared to be the only option. The Lion's Club in Kuching kindly agreed to donate a corneal sclera button and a donor cornea was obtained from Sri Lanka in four days. Repeated operation was carried out two weeks from the initial perforation. The amniotic membrane over the wound was removed and the cornea edge and base were cleared of the calcification plaque. Following the removal of the plaque, the area of perforation measured 4.5 mm in its widest diameter. A corneal sceral button measuring 7 mm was punched out and sutured to the cornea and the sclera. Conjunctival flaps were sutured to the edge of the limbus to cover the donor sclera. Figure 3. 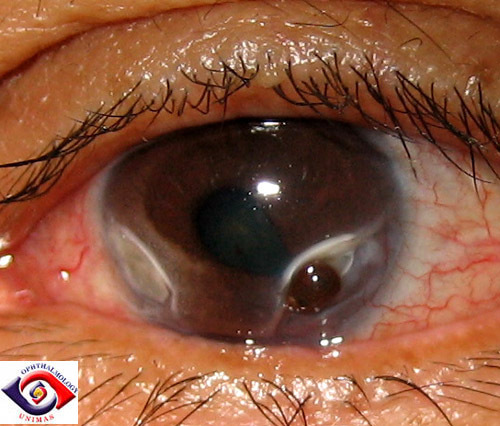 Two days after localized penetrating keratoplasty, the anterior chamber was formed. Post-operatively, the anterior chamber was reformed and the vision improved to 6/24 with pin-hole. He was treated with topical steroid, gentamicin, artificial tear and oral doxycycline. a. Apart from amniotic membrane and a penetrating keratoplasty, what are the other techniques which can be used in tectonic procedures? b. How successful is amniotic membrane in tectonic procedure?